These meat-stuffed, breaded and fried olives are a typical specialty originating circa 1800 in Ascoli Piceno in central Italy's Marche region. Allegedly, they were invented by the cooks of wealthy families as a way to utilize meat leftover from abundant feasts. Each olive is painstakingly cut away from its pit in a spiral shape, then reformed around the stuffing: a combination of several types of meat (usually veal or beef, pork, and chicken), sauteed with a soffritto, stewed in white wine, ground, and mixed with grated Parmigiano Reggiano cheese and a touch of nutmeg. As usual, the different versions of the recipe are countless, and along coastal areas of the Marche, sometimes the filling is made with several types of fish. 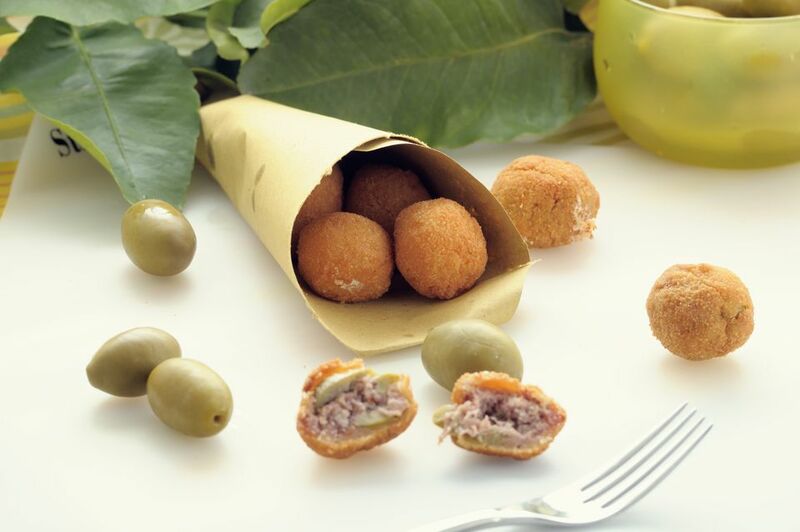 Today, these stuffed olives are popular throughout Italy and are often served as street food in paper cones at fairs, together with other fried foods as part of a "fritto misto" or with other light bites as a before-dinner aperitivo. Traditionally they are made with the large, green, mild "Ascolana Tenera" variety of olive (Oliva Ascolana del Piceno), a DOP product, but as those may be difficult to find in some places, you can use any large, mild, brine-cured green olive (using prepitted olives makes the entire process much easier). Using a sharp paring knife, carefully cut the flesh away from the pit of each olive in a spiral shape. Remove and discard the pits and set the spiral-shaped pieces of olive aside while you prepare the filling. In a large skillet over medium-high heat, heat the olive oil. Add the diced onion, carrot and celery and saute until onion is translucent and vegetables are softened, 6 to 8 minutes. Add the white wine and cook for 1 minute. Add the diced meats and salt continue to cook, stirring with a wooden spoon until meat is cooked, about 10 to 15 minutes. Puree the mixture in a meat grinder or food processor, then transfer to a large mixing bowl. Add the egg yolks, Parmigiano, lemon zest, nutmeg, and pepper. Stir to combine all ingredients well. Take small pinches of the filling and wrap an olive spiral around each one, reforming it to its original olive shape, pressing slightly so that the filling holds the olive together. Roll each stuffed olive in the flour, dip in the beaten egg, and then roll in the breadcrumbs. The stuffed olives should be only slightly larger than their original size. Don't overstuff, or they won't hold together. At this point, you can either fry the olives immediately or store them in the refrigerator or freezer until you're ready to fry them. Heat the frying oil in a large heavy-bottomed, high-sided pot until hot, but not smoking, and fry the breaded olives in batches; do not try to fry too many olives at a time, or it will lower the temperature of the cooking oil and they will not brown evenly or cook properly. When olives are evenly golden brown, remove the olives from the frying oil using a perforated metal spoon or mesh skimmer. Drain briefly on a paper towel-lined platter or tray and serve while still hot, with lemon wedges.